This entry was posted in Image Descriptions by thrum. Bookmark the permalink. Thanks Evening Pilgrim. 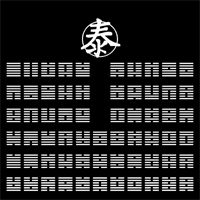 I’m quite fascinated with the iChing and read this post with great interest. Do you consult the iChing for guidance? Hi Lori. No, not guidance as such. But I’m fascinated too! I think I recall Jung expressing the view that the psyche is a personality-generating system — that over time a cluster of images can acquire sort of a center of gravity and achieve something like personhood and autonomy. I’ve heard that some people who have studied the iChing find themselves feeling like they are engaged in a conversation. Fun to imagine.